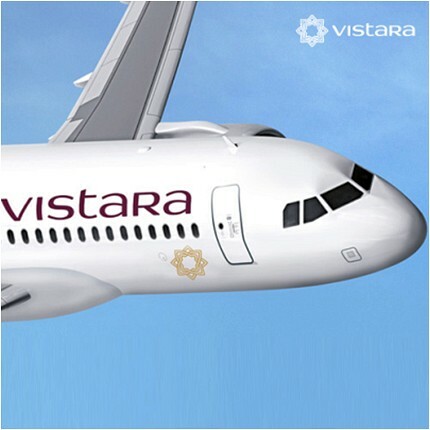 Vistara, the TATA-SIA joint venture domestic full service airline based out of Delhi will connect Bangalore to Delhi and Mumbai effective 16th June 2015 (tomorrow), with one flight each way, each day. This will coincide with the 159th day of operation of the airline. The airline also doubles the Delhi-Lucknow and back frequency. In the process, the airline will withdraw one service between Mumbai and Ahmedabad (UK968 and UK953), reducing the weekly frequency to 6 from 13. The Delhi-Lucknow sector is faring well for the airline. After the addition of the new sectors and withdrawal of flights, Vistara will operate 237 weekly flights with six aircraft connecting 10 cities, deploying a weekly capacity of 35 million ASKs. This is a remarkable growth in just a little over six months of operations. Of these 35 million ASKs, 21 million are deployed on category 1 (CAT I) routes that connect metros to metros. The remaining are deployed on CAT II routes (connecting ‘neglected’ regions with other cities), CAT IIA routes (connecting cities/towns within neglected regions), and CAT III routes (connecting other cities not included in CAT I, II and IIA). The capacity on CAT II, IIA, III routes are 12%, 2% and 51% of the CAT I capacity, meeting and exceeding the DGCA requirement for capacity deployment on these routes. The airline’s six aircraft will fly up to 35 flights a day. One of the aircraft rotations fly up to 12:20 hrs, while the Bangalore rotation flies 8:55 hrs. The average aircraft utilisation will settle at 11:14hrs per aircraft per day. Typical turnaround time is 40-45 minutes. The flight from Bangalore halts at Mumbai for 5:25 hours, sufficient to operate a Mumbai-Goa sector – something the airline isn’t keen on operating now due to the stiff competition on that route. The Delhi-Bangalore flight operates in the morning and the return in the evening, making it very convenient for a Delhi business traveller, but unattractive to a Bangalore based business traveller. For a corporate focussed airline, this sparse service is a surprise. AirAsia India, which caters to the leisure traveller, offers much better frequencies and timings for business travellers based at either city. The airline will increase frequencies on the Bangalore – Delhi sector with the induction of its 7th aircraft. The airline however offers multiple other connections to Delhi from Bangalore via Mumbai, with the most attractive connection (direct, lowest cost) being featured at the bottom of the list of options. This may need to be corrected to sort by connections, rather than time of departure. The airline’s target of a 9 aircraft fleet by end of calendar year 2015 still sticks. Two of the aircraft will be fitted with the wireless in-flight entertainment system, which will later be rolled out fleet wide after an evaluation on these two aircraft. Vistara, which by end of year will be a true full service carrier with the IFE system, is launching a new in-flight menu offering from 1st July. The new menu is derived from the feedback received from customers over the last six months of operation. The airline is tying up with multiple companies of the TATA group to offer cross-company benefits to customers. The month of May was the first month of high travel demand (one of the two high domestic demand months in a calendar year) that Vistara witnessed. Load factors at the airline were 69%. The airline’s relatively low brand awareness may be impacting the airline’s loads and perhaps in part its pricing power. Marketing activities at the airline may need to be stepped up to effectively communicate the benefits of a fairly less known and new product – premium economy, which accounts for 24% of the airline’s seats. When the DGCA notified the public that TATA-SIA airlines, now operating under the brand name Vistara, had applied for an Air Operator Permit, the DGCA had made public the joint venture’s proposed route pattern, detailed below. In the light of the temporary relaxation in meeting route dispersal guidelines handed to Vistara, The Flying Engineer analyses the proposed route pattern for year 1. The proposed route pattern, as handed over to the DGCA during the application phase during April 2014, had listed Mumbai, Goa, Bangalore, Hyderabad, Ahmedabad, Srinagar, Jammu, Patna and Chandigarh as destinations – either non-stop or with one stop, from Delhi. Based on the weekly frequencies, we’ve computed the average daily frequency, and computed the capacity (in available seat kilometers – ASK) as per ICAO’s Air Transport Bureau (ATB) guidelines. The proposed route pattern for one year generates enough capacity on CAT IIA, but generates a CAT II capacity that just meets or falls slightly short (0.18%) of meeting the capacity as stipulated by the existing (at the time of writing this piece) Route Dispersal Guidelines (RDG) as laid down by the Ministry of Civil Aviation (MoCA), India. However, the airline, in its original proposed route pattern, could notwhere have met the required capacity on CAT III routes, as shown in the table on top. The airline’s present pattern, which includes DEL-BOM vv, and DEL-AMD-BOM vv, does not conform with the original proposed pattern. The frequency on DEL-BOM nonstop is already 21 a week, each way. The DEL-AMD-BOM pattern, which was to have kicked in during the second year of operations, started on the second day of the airline’s operations. 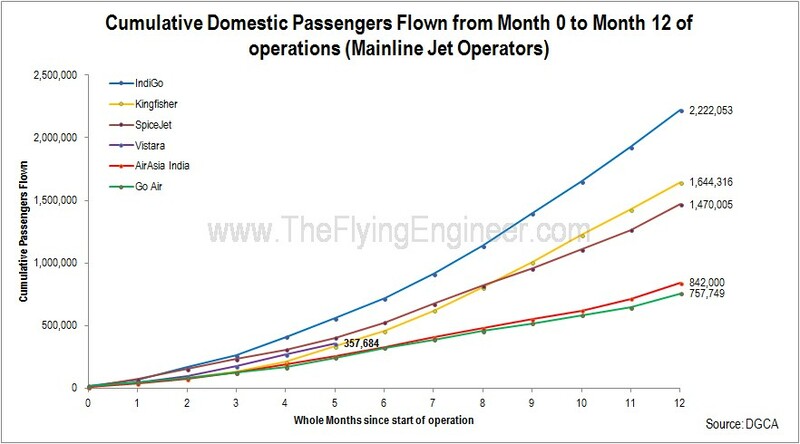 It allows the airline to make money in a lean season by flying on business routes which are not much affected by seasonal variations, while ramping up fleet and mainline network strength. It will allow the airline to deploy disproportionally high capacity on CAT II/IIA and CAT III routes (to compensate for the first three months of operation, starting January 9th 2015) during the summer (Q1 FY15-16 / Q2 CY15), when demand for travel is high, due to a holiday season. With this strategy, the airline may be able to minimise its losses in Q4 FY’15 and perhaps maximise its revenues in Q1 FY’16. Statistically, Bangalore ranks the third among all cities in India as far as domestic passenger movements are concerned. In FY13-14, Bangalore witnessed 10.2 million passenger movements, which is after Delhi (24.2 million) and Mumbai (21.9 million). Besides Tier I cities, Ahmedabad had the highest traffic, of 3.6 million passenger movements. Going by Vistara’s priority in tapping lucrative, proven markets, Bangalore may be either the next Tier I destination or simply the next destination after Delhi, Mumbai and Ahmedabad. Goa witnesses the third highest passenger movements among non-Tier I cities, and may also become the airline’s next Tier II destination (CAT III route). It will not be surprising to see Vistara choose Pune as another Tier II destination, soon. Pune had the second highest non- Tier I traffic after Ahmedabad, at 3.5 million movements. The original pattern would have required an average of 51:40hrs of block time to be clocked, per day (which will vary on a daily basis based on non-daily flights). The actual daily block time would have been between 50:30hrs to 53:20hrs. Assuming a conservative 10hr aircraft utilisation – per day per aircraft, the airline will require 6 aircraft to fly the original proposed pattern. The airline already has two aircraft flying, and a third in Delhi. Two others are ready at Toulouse and will be delivered by March end (2015), taking the total to five. With one aircraft per 1.5 months expected post March 2015, Vistara may be able to fly its original planned network in May 2015, should it still hold. 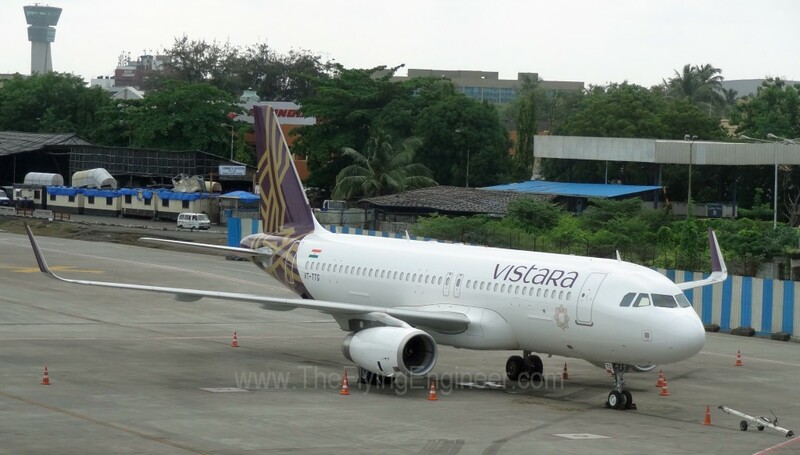 But considering that the airline may end 2016 with 13 Airbus A320-232SL aircraft, it is likely that Vistara will far outgrow its original proposed network, even with the backlog of RDG – mandated capacity that will have to be flown. With this in mind, it may not be surprising to see Vistara expand its network to Guwahati, Kolkata, along with few other stations. The projected growth seems both achievable yet aggressive. Network service and on time performance are important yet just two of many factors that influence people to choose an airline. Vistara is just one of three full service carriers in India, bringing with it a strong brand formed by established and well known players – Singapore Airlines and Tata Sons. This will attract the discerning traveller. Full service carriers play the yield game, generated largely by the first class in their aircraft – the business class. The airline has 16 business class seats on each of its aircraft. 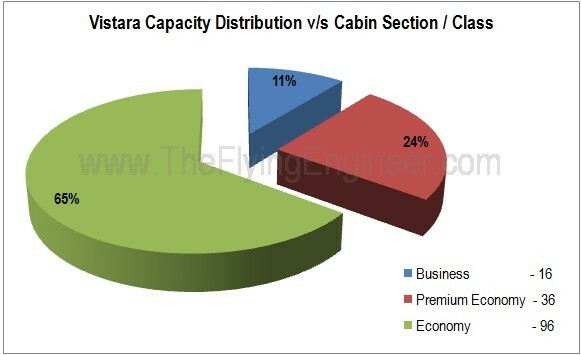 However, the only product differences between a low cost carrier and the premium economy (36 seats) and economy sections (96 seats) of Vistara are the food, the renowned oriental style emphasis on service and higher pitch comfortable seats, as the airline offers no in flight entertainment options or support. How these two cabin sections of Vistara will compete with other airlines is to be seen. For example, for travel on February 15th between Mumbai and Delhi (based on a search at the time of writing this piece), airlines including Jet Airways charge as little as INR 3,000 one way, while Vistara holds its ground at 6,520 one way. Whether brand name will prevail in a generally cost sensitive market is to be seen. However, there is also an emerging trend amongst people with disposable income who look forward to enjoying their money. Air Vistara, the newest Indian airline working towards an AOP, conducted its first two proving flights on 4th and 5th December, 2014, as officially confirmed by the airline. The first flight took off from Delhi’s Indira Gandhi International Airport at around 22:10IST (16:40UTC) on December 4th and landed at Mumbai’s Chhatrapati Shivaji International Airport at 5 minutes past midnight (00:05IST/18:35UTC) on 5th December. The return flight took off at 01:10IST (19:40UTC) and landed at Delhi at around 02:50IST (21:21UTC). Proving flights are the last stage of a lengthy process involved in securing an Air Operator Permit (AOP). Considering that the proving flights may wrap up by 7th December, the AOP may be awarded on 15th December, after the completion of the FAA Audit of DGCA, which is hoped to be completed on the 12th December 2014. The airline may start operations early January. When operations start, it will be the first full service carrier to be launched in a decade. Kingfisher airlines commenced operations in 2005 and no full service, pan-India carrier has since been launched. The airline was awarded its NOC from the aviation ministry on the 3rd of April, 2014, and applied for an AOP on the 22nd of April, 2014. The eight month period between AOP application and approval is similar to the period taken to award AirAsia India’s AOP. 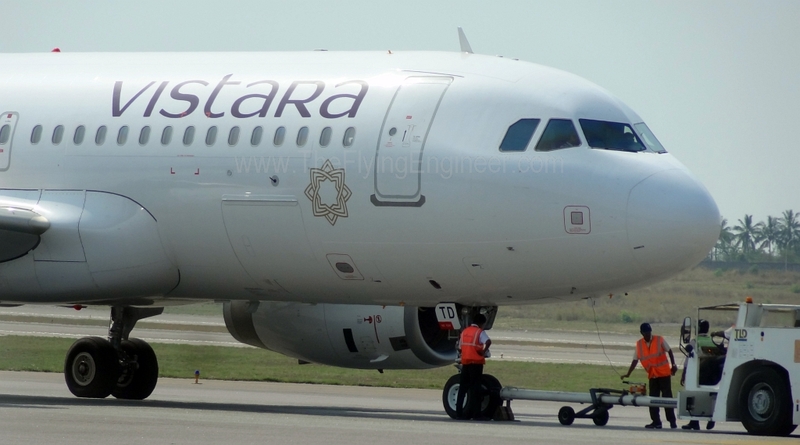 Vistara has two Airbus A320-232SL aircraft (A320/IAE V2527-A5 engines/Sharklet equipped) in its fleet, of which one is completed in the airline’s livery. The liveried aircraft performed the proving flight. The airline plans to have six flights between Delhi and Mumbai in the first year of operations. Other destinations planned in the first year of services are Goa, Bangalore, Hyderabad, Ahmedabad, Srinagar, Jammu, Patna and Chandigarh. The DGCA’s Civil Aviation Policy CAP 3100 stipulates that the airline ‘will be required to conduct a minimum of 5 flight sectors on intended routes, with total duration of not less than 10 flight hours’. The Delhi – Mumbai route contributes to around 1hr 40 minutes one way, adding to 3:20hrs for both ways. The airline will have to fly another 6:40hrs. Should the airline fly Delhi-Bangalore and back, it will add around 4:40hrs. The balance 2:00hrs may be picked up by flying either to Ahmedabad or Patna and back. The liveried aircraft, registered VT-TTB, is the first aircraft that the airline received on the 24th of September, 2014, at Toulouse. The second aircraft, registered VT-TTC, was handed over to the airline five days later, on the 29th of September, 2014. The first aircraft got its livery at Singapore, and landed back at Delhi on the 15th of October, 2014, coinciding with the 82nd anniversary of JRD Tata’s first commercial flight from Karachi to Mumbai. Three other aircraft, registered VT-TTD, TTE, and TTF are at Toulouse, reportedly not delivered in the light of the uncertainty associated with the DGCA’s delay in granting the new airline company its Air Operator’s Permit. The fifth aircraft recently flew to Hamburg, Germany, where the cabin interiors are fitted. 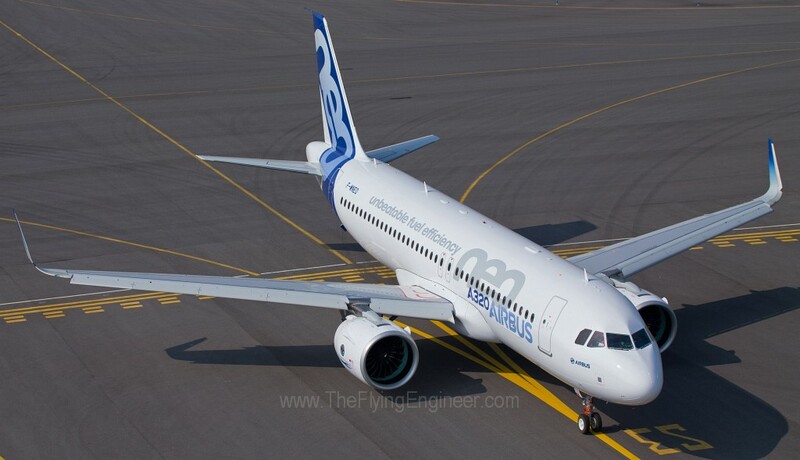 The airline plans to have a fleet of current engine option (CEO) and new engine option (NEO) A320 aircraft. The first 20 Airbus aircraft are to be leased from BOC Aviation – a Bank of China company that has its origins in Singapore Airlines. The duration of the lease agreement is six years for the A320-200 CEO aircraft and twelve years for the A320-200NEO aircraft.